The connection between acne breakouts or flare-ups and vaping (smoking using an electronic cigarette) is just not clear. Some say their acne went away completely after they started vaping while still others say they got acne even though they had never had it before. The only clear answer is that smoking does affect and worsen acne and trying to quit is better than nothing at all. Though that is true, it’s worth looking at vaping as a contributing factor, or not, in acne sufferers. This particular report is based on answers from people who previously smoked and are now vaping in order to put down the tobacco and all the harmful chemicals found in cigarettes. Many people have begun vaping “just to do it” or because “their friends do”, and this is not about those vapers. Smoking is a definite antagonist in the cycle of acne. Introducing chemicals such as arsenic and formaldehyde to the body sends it into a frenzy to get rid of it. Most often, we see that expulsion manifest on the skin. From yellow, leathery skin, to pimples and cysts, the body will get the toxins as far away from vital organs as possible. People who suffer from acne are well aware of this and most at least try to put down the habit, while others continue… possibly to lessen their acne depression. 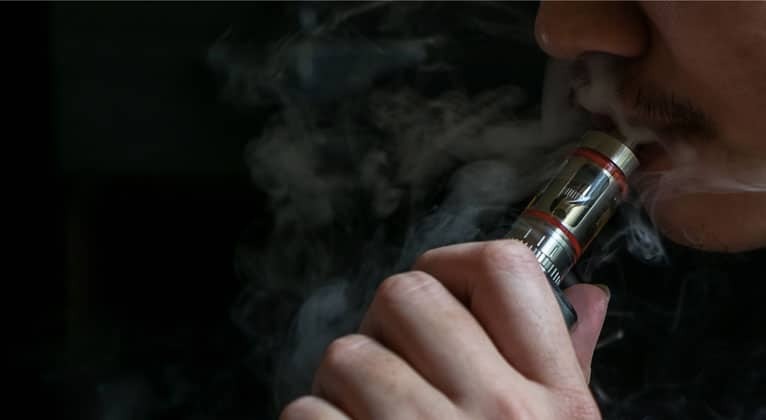 But now, vaping has screamed onto the scene to try to help smokers lessen their intake of toxins and tobacco and even eventually quit the habit altogether. With flavors from typical cigarette taste to chocolate, caramel, raspberry and even Mt. Dew, vaping made quitting the traditional cigarette much more appetizing than just quitting “cold turkey”. The ingredients of e-juice or the flavor “syrup” used in electronic vaping devices or “vape pens” is made of only a few ingredients and may or may not contain nicotine. These ingredients are normally food grade propylene glycol and/or vegetable glycerin, a non-toxic thick liquid which is used in most cosmetic products, mouthwash, and food coloring, natural and artificial flavors that are all food grade and if the customer so chooses, a bit of nicotine. All of these ingredients are non-toxic but of course once vaped, release different chemical compounds as they are heated to produce the vapor that is exhaled. This vapor has been tested many times and each time it is found that the chemicals released and exhaled hold over 90% less harmful chemicals than traditional cigarettes. Though there are debates on whether the vaping industry should be regulated. No seller of vape pens claims that they are 100% safe but over 90% better than a regular cigarette seems like a good place to start for someone trying to quit! So what’s the connection to acne? Again, the answer isn’t clear, but of course, any change in lifestyle habits creates an effect in and on the body. And something like Pro Active isn’t going to be the be-all, end-all solution if there’s an underlying problem causing the acne. What Do The Reports Show? There are people who report that as they transitioned over to vaping, they saw a slow decrease in their acne. Breakouts were few and far between and their skin begin to heal without leaving behind the discoloration often caused by pimples. Some of these vapers went on to report later that their acne had completely healed even though they were still vaping and this was the only change they had made in their habits. Flare-ups and breakouts around the mouth were reported by some new vapers. After suggestions that they might be touching this area more than usual because of the moist feeling after exhaling vapor, the vapers made changes to this habit. Ultimately, it cleared the area and as they continued vaping, they too saw improvement in their skin. Not everyone who transitions to vaping is going to see a full recovery from acne, as smoking is rarely the sole factor that caused the acne. Some vapers who hoped for changes in their skin found that vaping didn’t make a difference. It did, however, change their overall health and they felt happier and more able to deal with the appearance of their acne. In other words, switching to vaping may help the psychological effect of acne called acne depression. For those who reported that they began to see acne appear only after beginning to vape, their symptoms were unexplained. Many of these vapers returned to conventional smoking and there are no reports in regards to their present acne conditions. Remember, these vapers were smokers before and still suffered from acne once switching to vaping. Some claimed that it could be “quit zits” and continued to vape although they still had breakouts. “Quit zits” are pimples that appear right after a person makes a sudden change in their habits, most often seen in those quitting smoking whether they begin vaping or not. These can be bothersome but totally worth the wait for them to pass if it means stopping the habit of smoking cigarettes. Their breakouts continued but lessened in severity. These vapers also chose to continue vaping for their overall health. As research continues, it may be found that there is indeed an ingredient or by-product causing acne. Even if the findings do confirm this, it’s apparent that scientists and doctors much prefer to see their patients vaping rather than smoking and will not admonish them for trying the vaping method as a means to quit. Vaping and acne may not go together as a treatment to an illness but it sure does make sense that if you are a smoker and trying everything you can to treat your acne, you might want to at least consider vaping. Pregnancy Acne – What Are The Best Pregnancy Acne Treatment Options?